Started by metmike - Sept. 12, 2018, 6:21 p.m.
"If the Category 4 hurricane does, indeed, hit the Carolinas this week, it will be the strongest storm on record to land so far north. "Yet when it comes to extreme weather, Mr. Trump is complicit. He plays down humans’ role in increasing the risks, and he continues to dismantle efforts to address those risks............ there is no reasonable doubt that humans are priming the Earth’s systems to produce disasters." Let me introduce the Washington Post to my friend: "Mr. 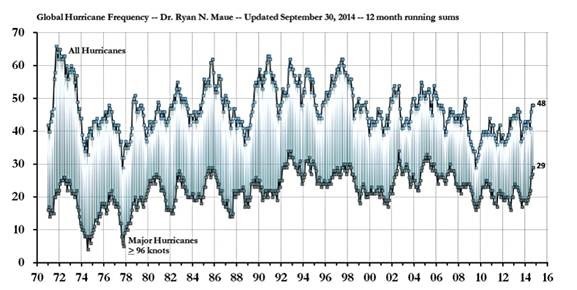 Authentic Science", who also goes by the name of "Mr. Empirical Data"
Are you sure you want to delete this post: A ludicrous thing to blame on Trump.... hurricanes ? By mcfarm - Sept. 12, 2018, 6:25 p.m.
Are you sure you want to delete this post: Re: A ludicrous thing to blame on Trump.... hurricanes ? By metmike - Sept. 12, 2018, 6:44 p.m. I hadn't thought much about the "deep state" until we elected this president. There are 11 on this list. 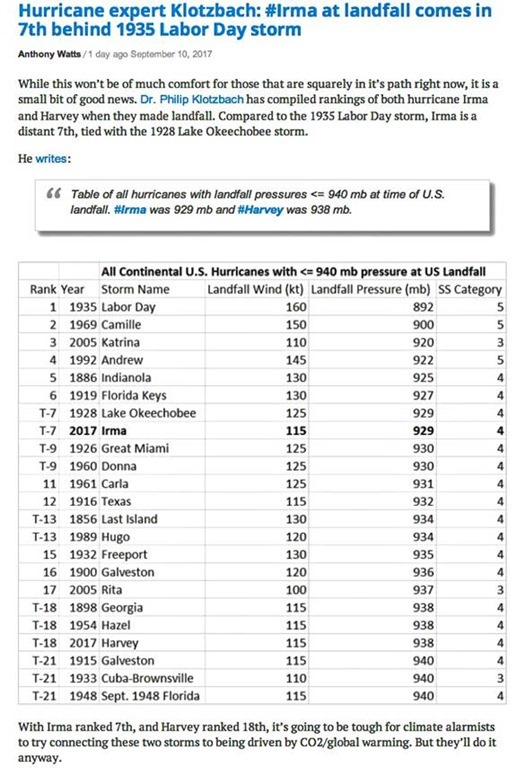 Irma last year was number 3 and it was a monster, though winds with Andrew were much stronger in 1992. Katrina was also up there as #4 and we could say that was in the age of global warming/climate change(it certainly got blamed on that) but the strongest hurricane ever was in 1935 and #2 was 1969..............so we need to stop this "unprecedented, worse ever, strongest ever" stuff and that hurricanes are getting worse. By metmike - Sept. 12, 2018, 6:58 p.m. 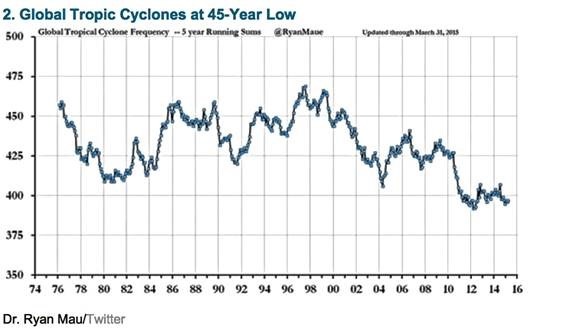 If global warming/climate change is causing an increase in major hurricanes, then how did the hurricane season of 1954, during global cooling happen? 3 major hurricanes in less than 3 months to effect the East Coast. Nothing close to that has ever happened since. There was even a hurricane in late December of that year! Remember that we were told in 2011, that Super Storm Sandy was unprecedented? Well, it moved faster but Hazel developed with very similar atmospheric conditions in 1954 when a cold upper level pattern featuring an -NAO in the Northeast US/Southeast Canada merged with the remnants of the hurricane. Hazel was stronger. Sandy dumped more rain. Are you sure you want to delete this post: Re: Re: A ludicrous thing to blame on Trump.... hurricanes ? By metmike - Sept. 12, 2018, 7:10 p.m. This article above, blaming Trump, claims that Florence will be the strongest this far north. 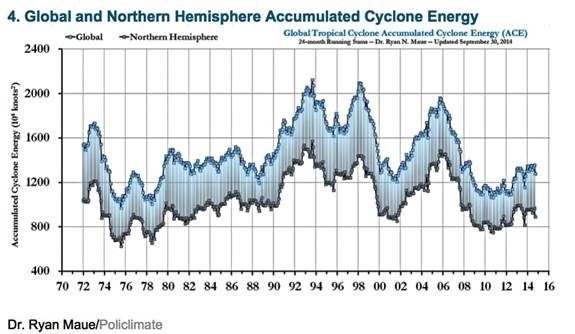 Like major hurricanes never went very far north before global warming??? The Great New England hurricane in 1938 dispels that myth. And that may not have been the strongest hurricane that far north. The Great Colonial Hurricane of 1635 gets those honors. What's especially noteworthy about this hurricane is that it occurred during the Little Ice Age when global temperatures were at their coldest in at least the last 2,000 years. 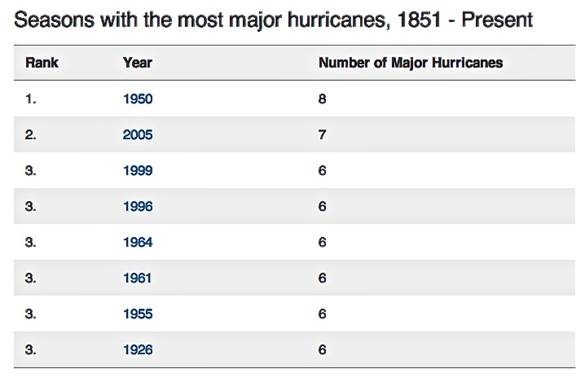 Speaking of Great Hurricanes during the Little Ice Age. The one that killed the most people ever occurred in 1780. There are other examples but these are the most noteworthy in busting the myth. How does a myth like this get spread? Because the media knows that people don't have weather records at home to check them. They obviously are either not checking themselves because they are too lazy or more likely they are so blinded with an agenda, that they interpret everything based on their political belief system............including science, weather/climate. So they can exaggerate weather and climate until the cows come home............with impunity. There is no entity that corrects them with the stuff I'm showing you............as an objective, independent atmospheric scientist. Are you sure you want to delete this post: Re: Re: Re: A ludicrous thing to blame on Trump.... hurricanes ? By metmike - Sept. 12, 2018, 7:28 p.m. The warmer atmosphere can clearly hold more moisture, around 4-5% more than 150 years ago. So it probably made Harvey worse last year. Which may have added 2 inches of rain to the record total. So you might say that the record would have only been 49-50 inches vs 51.9 inches of rain. No question that excessive rain events have increased on this planet............but drought has also decreased over the past 40 years. However, that amount above was for a 3 day total. The record for rain in 24 hours was NOT broken. 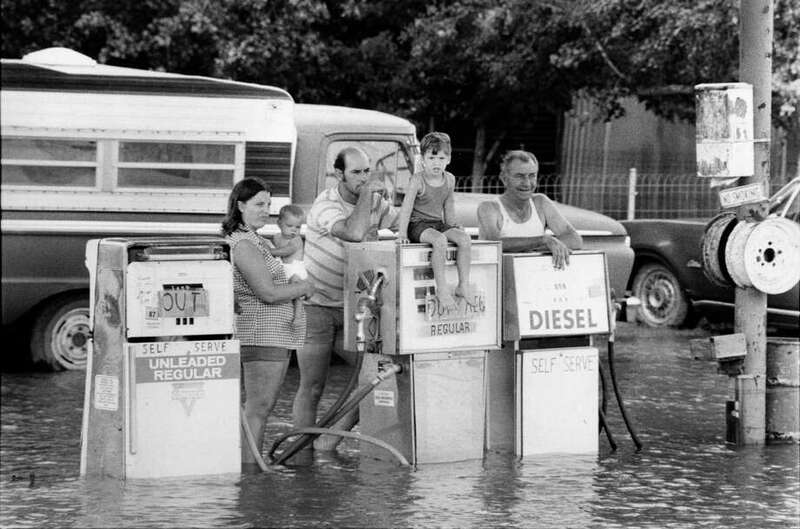 That record still stands and was set by tropical storm Claudette in July 1979., when 43 inches of rain fell. Most of that in a 10 hour period if you can imagine that. The world record for the most rain in 24 hours was 73.62 inches that fell at Cilaos on Reunion Island, east of Madagascar, on March 15-16, 1952, half a century ago. By silverspiker - Sept. 12, 2018, 7:28 p.m.
By metmike - Sept. 12, 2018, 7:40 p.m. Thanks silverspiker. You have the best sense of humor here. 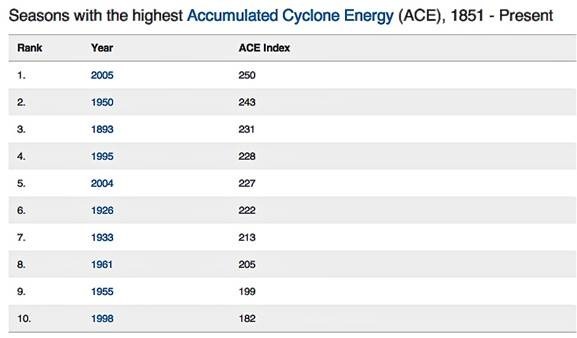 Here's more relevant stuff on hurricanes NOT increasing. From Watts Up With That(WUWT) last year. By metmike - Sept. 12, 2018, 7:57 p.m.
What other weather/climate disasters is the planet being subjected to thanks to President Trump? By 7475 - Sept. 12, 2018, 8:09 p.m. I love these stats you show us. I wish I could print out these sheets and hand them to "those" people who REALLY need to be woken up. But aint got time and Im so repulsed by "their" crying and" their" attitudes I dont have the desire either. I just want to distance myself from the idiots. Im pretty disgusted after seeing that article in WP. By metmike - Sept. 12, 2018, 8:49 p.m.
As an atmospheric scientist, it's been especially frustrating to watch climate science and weather hijacked for a political agenda. And a completely bogus Climate Accord. I am in the front of any line with the objective of helping the poor and strongly supportive of all legit actions intended to lessen pollution and conserve natural resources. The Climate Accord has several actual objectives. One of them is not to change the climate because it would do nothing to the climate. Even if CO2 was the driver of climate, the accord allows China and India to continue to greatly increase their CO2, much more than any cutting we would do. The Climate Accord is fraudulent for another reason. It's more based on taking a trillion dollars from the rich/developed countries(with the US contributing the most) and giving that to the poor/undeveloped countries. If you want to help those less fortunate, how can you be against that? Here's the deal. They are hiding this.........not up front. This would allow much of that money to go to realms that people(tax payers) from countries donating the money don't want it to go to. One of those realms that they define is "climate adaptation"
Are you kidding me? We've had the best weather/climate in the last 1,000 years! Money going to climate adaptation is going to end up being used however those that get control of it want to use it. Can you say graft. We have an agreement based on totally bogus science and lies that supposedly has an altruistic motive, regarding the transfer of wealth...............that they are hiding. If their motives were truly altruistic, they wouldn't have to conjure up a scheme by hijacking climate science to sell it to us. The truth always works best if what you have in mind is in the best interest of the people. The truth is sadly lacking in the Paris Agreement! By metmike - Sept. 12, 2018, 9:39 p.m.
By GunterK - Sept. 12, 2018, 10:35 p.m. I knew it!!!!! Obama beat all the other presidents, by far. Are you sure you want to delete this post: Re: Re: Re: Re: A ludicrous thing to blame on Trump.... hurricanes ? By wxgrant - Sept. 12, 2018, 11:31 p.m.
All I can say is GREAT stuff Mike. Thanks for all the graphics. I have seen them before but can never find them. I hate the way anything in weather happens it is automatically blamed on climate change. This has to stop. And this type of info will help me spread the word too. Are you sure you want to delete this post: Re: Re: Re: Re: Re: A ludicrous thing to blame on Trump.... hurricanes ? By mcfarm - Sept. 13, 2018, 7:06 a.m.
Are you sure you want to delete this post: Re: Re: Re: Re: Re: Re: A ludicrous thing to blame on Trump.... hurricanes ? By cliff-e - Sept. 13, 2018, 7:18 p.m. I blame Trump for undoing efforts to slow climate change. And Trump is to blame for essentially robbing the agency created to aid and assist those affected by natural disasters. As for Trump claiming success in dealing with the Puerto Rico hurricane disaster...what a sick joke that is. By metmike - Sept. 13, 2018, 9:59 p.m.
"I blame Trump for undoing efforts to slow climate change." I completely understand why you and many, many millions believe this way. We have been bombarded for 2 decades now, with information that tells us that the entire world and all of its scientists believe we are having extreme/catastrophic weather because of climate change and it's going to get much worse if we don't do something now. 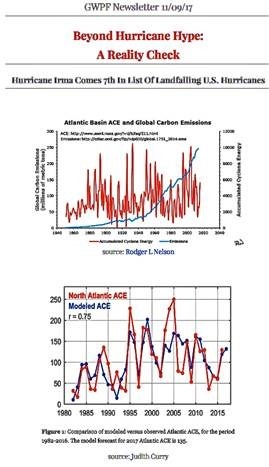 Some yahoo atmospheric scientist in Evansville Indiana with a bunch of data and graphs that show something different is not going to change your mind or anybody else's mind because, as Al Gore stated over a decade ago "the science is settled". However, you have been a farmer for decades. You understand crop growing and plants better than almost everybody on the planet. You understand numerous elements that play a role, like soil fertility, micro-nutrients and acidity/ph. You also understand how weather effects your crops.........whether its during planting or the growing season or even during harvest. On your land, you know exactly what's growing, how much of it is there and why it's growing the way that it is. You don't need to read a story/article online or from some other source to tell you what's there. Your hard work, risk taking and knowledge using every advantage available with today's technology is what made your crop what it is every year. You are only 1 farmer but you know exactly how the entire US Cornbelt has been doing for the decades that you've farmed. This is why I appeal to you, using this area of your own elite expertise in applying your personal observations to compare them with what you've been told, to see if what you've been told the past 2 decades is actually happening or not. Has extreme weather from climate change reduced crop yields as we've been told? Has drought increased as we've been told would happen? If the answer is........."not yet", then why would you continue to expect something to happen based on what you're being told, when that source has been saying the same thing for almost 2 decades but the 100% opposite has happened. They were not just a little wrong but they were as wrong as it gets for crop production and the plant world. In this realm YOU are the expert/authority. YOU decide based on your professional opinion. Have droughts increased as one side has insisted would happen? Since 1988, we have only had 1 widespread severe drought in the Midwest(2012) when historically, we should have had at least 3 of them. Has flooding increased? The answer should be yes. Has this increase in flooding caused enough crop adversity to effect long term crop production? Don't base it on what others tell you or even flooding incidents in your field but on what the Cornbelt production is at the end of every year. That is the metric to measure climate change's effects on crops. Is climate change causing crops to get smaller from weather adversity or to get bigger? Not weather/climate change from computer model simulations going out for 100 years using a speculative theory but the real weather/climate right here in the Cornbelt that happened in the real world the past several decades. The one you lived and farmed in with alot of skin in the game. By metmike - Sept. 13, 2018, 10:11 p.m. Here is a graph of crop yields. Of course the introduction of using nitrogen fertilizer is what caused corn yields to explode upwards over 60 years ago. But obviously, we haven't just been dumping more and more nitrogen on the crop each year to get a graph going straight up. There are numerous elements that have contributed. You can see from the graph, the 2 drought years that stood out(1988-2012). 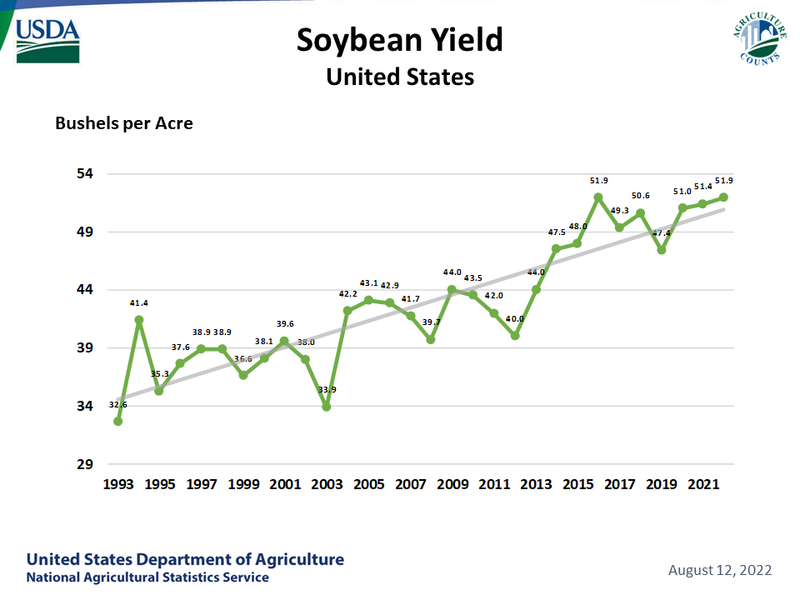 If it was all just about the nitrogen, then soybean yields would not have doubled over the last 30 years. One of those key elements is weather/climate. As somebody that understands the effects of weather/climate on the crops, you can appreciate, based on your experience and this graph, that the weather for growing crops over the past 40 years had been THE BEST since the Medieval Warm Period 1,000 years ago. By metmike - Sept. 13, 2018, 10:18 p.m.
Those graphs only tell us what the yields were, not the specific weather, which can't be graphed in the same manner. However, there is something that has had a massive effect on all the crops over that period that can be graphed. By metmike - Sept. 13, 2018, 10:32 p.m. So that CO2 graph is pretty impressive, especially if you believe that CO2=pollution. And especially if you think that this is causing extreme weather and catastrophic climate change that will only get worse because climate models project that. You and almost everybody else must rely on your information sources to know what you know about CO2 and climate. But what is cliff's first hand experience as a farmer actually telling him about CO2, weather and climate change? Would we really be better off with the "old" climate of 100 years ago, before CO2 increased and global temperatures went up 1 Deg. C ? The reality is that if we could take the atmosphere back to those levels, crop production would drop around 25%. Within several years of such a scenario, over 1 billion people would starve on this planet and food prices would likely triple. Yeah, really. Do the math. Cut 25% from world supply for food crops every year(which would happen just from the CO2 drop) and you can no longer feed almost 7.6 billion people. The world population would have to drop significantly. Corn grown for ethanol would have to go and prices for all crops would likely triple to ration demand. By metmike - Sept. 13, 2018, 10:51 p.m.
CO2 is currently at just under 410 parts per million. Have we maxed out on the benefits of it serving to fertilize all plants? But we were told that when it hit 400 ppm.......and 390 ppm. The reality is that benefits would continue at 1,000 ppm, which will never happen. Are there some negatives that will happen as we continue to increase CO2? Yes, of course, I discussed that in a response to you a week ago and readily acknowledge them. This is all a matter of weighing those negatives compared to positives and doing so, by having the objective information about both. One side only tells you all the bad stuff, greatly exaggerates it and blames almost everything bad on climate change. But you have the expertise to see beyond that because your growing crop, every year, is sort of like a science experiment on the effects of CO2, weather and climate on corn and soybeans. One year with record crop production is not proof that climate change and increasing CO2 is a good thing. However, several decades of similar results is overwhelming evidence. By cliff-e - Sept. 14, 2018, 12:04 a.m.
A lawyer friend of ours once said- " This may sound like a good idea but let's think it thru to see how it's really gonna turn out." Sage advice. By metmike - Sept. 14, 2018, 1:19 a.m.
What is conveniently/intentionally, always left out is ................that 97% number also includes climate scientists that believe the warming is beneficial, including people like myself that believe that at least half has been from humans and most of it beneficial. Please at least consider accepting my challenge to you. Step outside the realm of being told how to think about the increase in CO2 and warming and its effect on the planet and just use your personal long lived, expert observations in a field where YOU are the authority and decide for yourself how climate change has been effecting corn and soybeans for the past 30 years. One or 2 years is just weather. 30+ years is considered long enough to be climate. Since 1988, what has been the climate in the Midwest for growing yours/everybody's crops?